The Jesuit Voices collection is a subset of the American Scholars of Religion Project. The aim of the Jesuit Voices collection is to increase, highlight and preserve the voices of Jesuit priests and faculty for the future. In these video clips we can watch a scholar at work and come to understand that scholarship is often the struggle to understand the question rather than posit an often simplistic answer. Preserving and making accessible Jesuit-affiliated religious studies scholars’ answers to important religious questions demonstrates the intellectual contribution our Jesuit institutions make to society’s deepest questions. 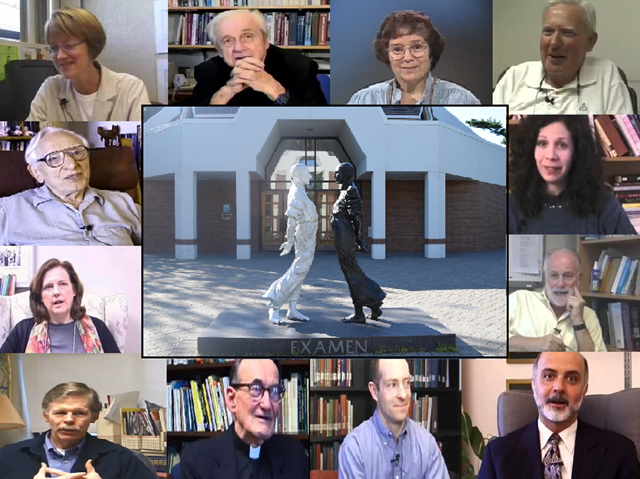 The American Scholars of Religion Project, begun in 1998, is a video oral history; it is a collection of short commentaries or vignettes that preserve and illustrate the thinking and scholarly personality of a diverse sample of American scholars of religion at the beginning of the twenty-first century. This American Scholars of Religion Project was conceived, created and produced by Dr. Alfred Benney. Dr. Benney is a Professor of Religious Studies at Fairfield University. He has a Ph.D in Theology from the Hartford Seminary Foundation and teaches courses in Non-Traditional American Religions and Christian Religious Thought. The Jesuit Voices project was led by librarian Jacalyn Kremer, as part of her Ignatian Colleagues Program Project, 2014-2015. For more information, email her at .